You may be asking, “Brad, where have you been? Did you take an unannounced sabbatical from blogging?” Well, unintentionally, yes. In mid-February, I was throwing batting practice to my son and took a baseball to the face. He is really improving as a hitter. To say that the ball crushed my nose is no understatement. A couple of weeks later I had surgery and, thankfully, my nose is pretty normal now: pain free with good air flow. During that same month, I was in the middle of overseeing the churchcares.com curriculum video recording and completed the oral defense for my dissertation (if you care to see my new nose). That is why I’ve taken an unintentional sabbatical: (a) I’ve been busy and (b) it is bad blogging etiquette to post while concussed. This also accounts for why I may not blog a frequently for the next couple of months. But the topic of this post is trauma. This past weekend my son asked if I would throw batting practice to him again. After checking my wife (after a 6 hour unexpected “date” in the ER, mama gets to veto), I said yes. We got in the cage. I expected to be skittish. I didn’t fully anticipate my response. When the first baseball ricocheted off the L-screen (for the non-baseball-informed reader, that means my son crushed right back at me), a rush of heat washed over my body. I could tell my fight-or-flight response was highly activated. The adrenaline surge was very comparable to when I actually got hit by the baseball. I was able to keep pitching. My son could tell that I was extra-flinchy, but not much else. However, I could tell something was different in how I was responding to my surroundings. As a pastoral counselor, I’ve studied trauma a good amount. Here is something I knew, but that I learned in a new way from this experience – you can’t think your way out of a traumatic reaction. No amount of understanding what trauma was and that my experience was normal / warranted would eliminate the experience. This was not an experience for which I could “take every thought captive” and my body would respond with a corresponding and immediate decrease in anxiety. The thought-based emotional regulation strategy in 2 Corinthians 10:5, while excellent for anxiety rooted in rumination, was not an effective strategy for anxiety prompted by a traumatic trigger experience. Does that mean my understanding of trauma was futile? Not at all. My understanding of trauma helped me trust the experience of trauma less. One way to describe the trigger experience is that it was like alarms going off. It felt like an unexpected fire drill. 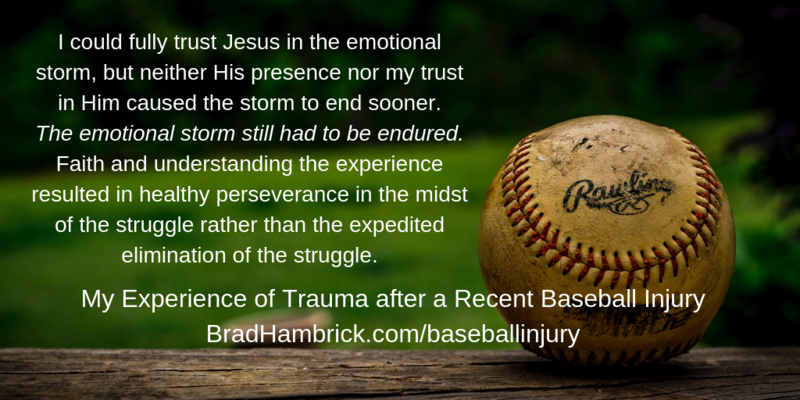 Understanding trauma helped me realize my reaction was to the “then and there” (my original injury) rather than the “here and now” (current experience of throwing batting practice). How much did this help? If you’ll allow me to speak out of both sides of my mouth, a great deal and not at all. At one level, it was comforting to know, metaphorically speaking, this was “just a drill.” On another level, this did nothing to reduce the combination of exhaustion and hyper-arousal (shakiness, feeling at risk, elevated heart rate, pupil dilation, etc.) I felt for the rest of the day. For these things, I could only care for my body well – rest, limit engagement with other stressors, disengage from activities requiring concentration, etc. Relating to the trigger response as “just a drill” helped me avoid making impulsive decisions: such as, (a) not responding to my family as if I was in a threatening situation, and (b) not allowing the elevated anxiety that played in the back of my mind like the theme song to the movie Jaws to cause me, again metaphorically speaking, to look for sharks all day. This allowed me to make healthier and God-honoring choices throughout the remainder of the day. Relating to the trigger response as “just a drill” did not remove the anxiety. I would argue that in trigger responses like this, anxiety is not a sin. I could trust God and rightly interpret reality in the manner described in the paragraph above, but still experience a pervasive sense of unrest due to my body’s memory / reaction to a current event that was similar to a traumatic past event. In this sense, I could fully trust Jesus in the emotional storm, but neither His presence nor my trust in Him caused the storm to end sooner. The emotional storm still had to be endured. Faith and understanding the experience resulted in healthy perseverance in the midst of the struggle rather than the expedited elimination of the struggle. I am not intending to say that my experience of a single-event, relatively minor trauma implies that individuals who have experienced more severe or multi-event traumas should be able to re-engage with difficult activities associated with their trauma as quickly as I did. The magnitude and repetition of the trauma impact the duration of the recovery. I do hope this reflection on my personal experience helps remove some common misconceptions about the experience of trauma. If this post was beneficial for you, then consider reading other blogs from my “Favorite Posts on PTSD” post which address other facets of this subject.